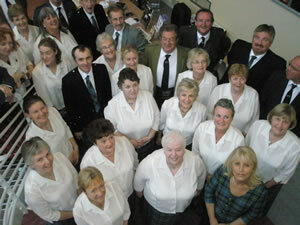 After a commendable performance at the 2008 Falkirk Mod, Aberfeldy & District Gaelic Choir has found itself undergoing some fundamental changes as it moves into 2009. Isobel Rutter, who came to our aid so nobly when we found ourselves without a conductor less than six weeks before the 2007 National Mod, has, with huge regret on both sides, had to turn down our pleas to continue as our musical director. Isobel's leadership has been a true inspiration to us all, and we consider ourselves fortunate indeed that she was able to commit so much time and energy to our cause. We wish her all the very best as she focuses on her other endeavours, most of which were neglected while she concentrated on helping Aberfeldy achieve its potential. Singing under Isobel's direction was an immense pleasure, and we would consider it an honour to be able to do so again in the future, should the opportunity arise. So, the Choir is recruiting..!